If you’re listing ways that Bates is distinctive, here’s another. Bates was the only undergraduate educational institution to take part in a recent international conference dedicated to research in an intriguing branch of chemistry. 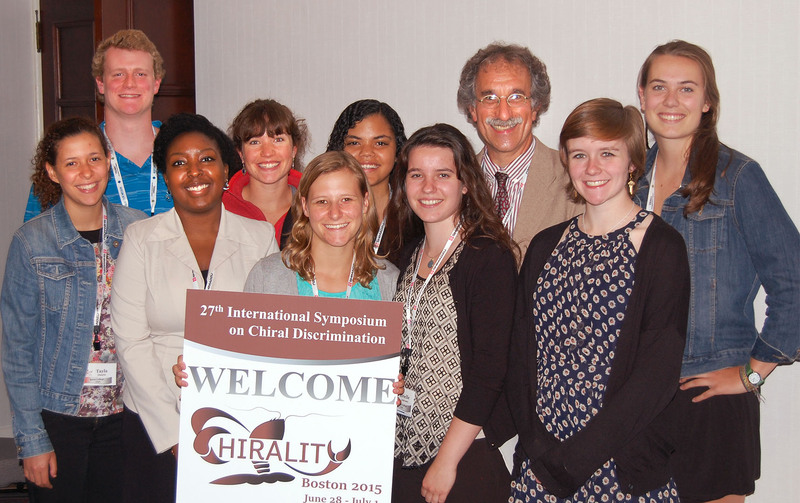 Tom Wenzel, Dana Professor of Chemistry at Bates, chaired the 27th edition of the International Symposium on Chiral Discrimination, aka Chirality 2015, in Boston June 28–July 1. The event attracted some 250 scientists representing 24 countries. “It’s highly unusual for a science faculty member from an undergraduate institution to be asked to chair a conference of this stature,” says Wenzel, only the second researcher from a U.S. undergrad school to chair the chirality event, founded in 1988. Wenzel brought nine current and former Bates students along. All the Bates students helped Wenzel with conference operations, and seven of them presented research. The Bates contingent’s travel and participation were paid for by a combination of college funds, an alumni gift, and Wenzel’s own National Science Foundation grant. A chemistry major, Rodriguez presented research that she had done with Wenzel, assisted by Tayla Duarte ’17 of Dorchester, Mass. Her classmate and fellow chem major William Patton of Asheville, N.C., presented research as well. The entire Bates contingent poses at Chirality 2015. Back row, from left, William Patton ’15, Mira Carey-Hatch ’14, Yolanda Rodriguez ’15, Tom Wenzel, Alison Dowey ’15. Front row, from left, Tayla Duarte ’17, Cira Mollings Puentes ’16, Caroline Holme ’16, Brielle Dalvano ’16, and Anna Berenson ’16. Also showing research at Chirality 2015 were Mira Carey-Hatch ’14 of Laconia, N.H.; Alison Dowey ’15 of Pound Ridge, N.Y.; Brielle Dalvano ’16 of Wyckoff, N.J.; and Cira Mollings Puentes ’16 of Kingston, Jamaica. Anna Berenson ’16 of Topsfield, Mass., and Caroline Holme ’16 of Winnetka, Ill., two rising seniors who work with Wenzel’s chemistry department colleague Paula Schlax, joined the seven Wenzel protégés as they helped with myriad on-site organizational details. And what is chirality? Pronounced kai-RAL-ity, it’s a phenomenon in which two molecules are mirror images of each other, like your hands. In some cases, such compounds have significant reactive differences. Wenzel is known internationally for his research in the field. His work has resulted in more than 150 publications and attracted more than $2.9 million in external grants, including seven rounds of research funding from the National Science Foundation. 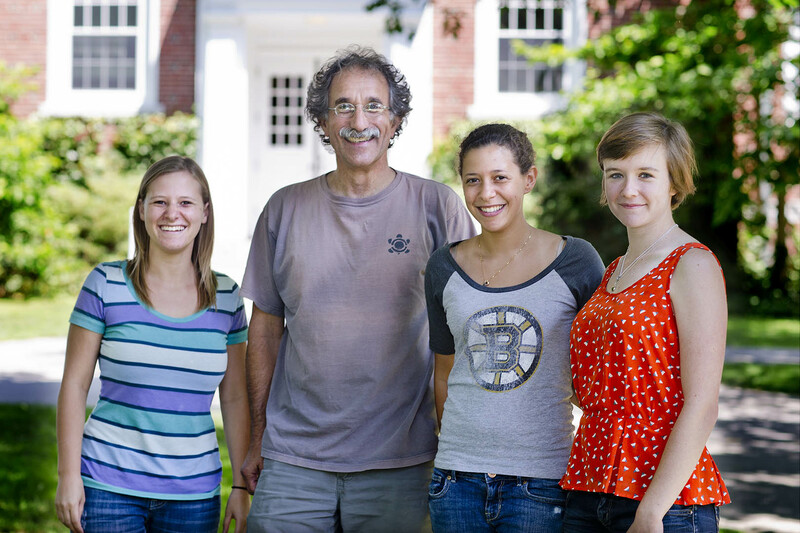 During Wenzel’s time at Bates, 125 students have collaborated in his research and 77 have co-authored peer-reviewed publications about the work (four high school teachers have also co-authored Wenzel publications). He has been particularly active in involving students from groups historically underrepresented in the sciences in his work.